One woman's journey into the greater world of baking and pastry arts . . . There's a little middle eastern restaurant near our house that has the finest and most fragrant lentil soup. My kids just adore it and so does my husband. This afternoon, as I was pondering what to make for supper, I decided to give lentil soup a try. The recipe that I used, torn from the Detroit Free Press, had been stuck on our refrigerator door with a magnet several months ago. I've probably glanced at that tattered piece of newsprint about a thousand times. 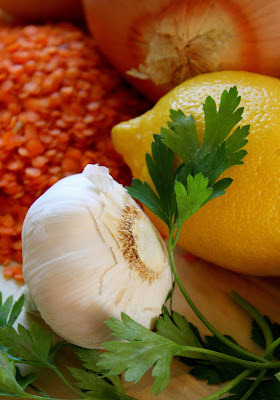 Finally, who knows why, the spirit moved me to buy some orange lentils and cook up a big pot of the stuff. I'm pleased to report that the recipe is a keeper. It got a giant seal of approval from my guys. When my husband commented that he thought it tasted better than the restaurant's formula, I knew I'd be making it again. The only liberties I took with this extremely simple recipe were to increase it, to be more generous with the spices (more cumin, salt, and black pepper), and to include a few squeezes of lemon juice. 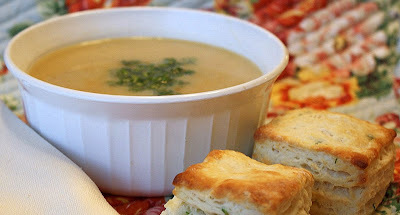 I also used an immersion blender instead of putting the soup into a regular blender (way, way easier--if you don't have one and you like to make soup, you need one!). Of course, a soup like this, tasty though it is, does not an entire meal make. Okay then, what to serve with it? 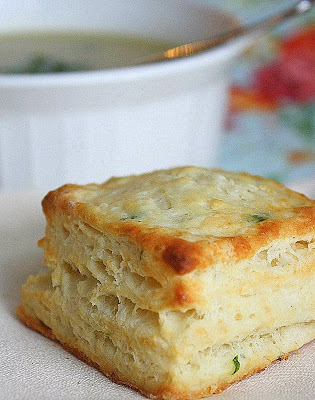 Well, I thought some savory biscuits might be just the ticket, and indeed they were. 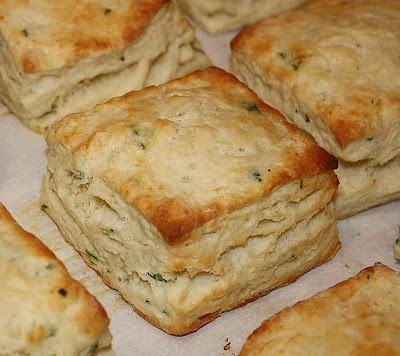 I used a recipe for a reliably fluffy, tender, buttermilk biscuit from the book Baking at Home with the Culinary Institute of America, but instead of leaving the biscuits plain I decided to add in some finely chopped fresh flat-leaf parsley along with a little fresh minced garlic. Perfect! 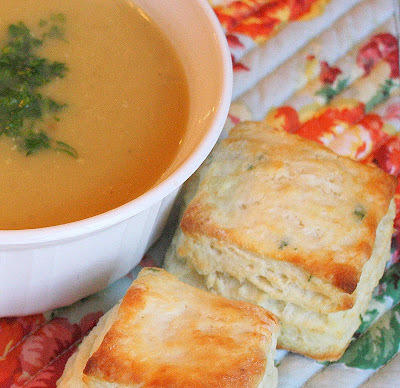 These were good biscuits, and they went along with the lentil soup like love and marriage. I placed a bowl of seedless red grapes on the table, alongside the biscuit basket, and we were good to go. In a large stock pot, heat the oil over medium heat. Saute the garlic for 1 minute, then add in the chopped onion and and saute until soft, about 5 minutes. Add the lentils and stir to coat them in the oil. Add in the water or stock and bring to a boil. Reduce the heat to medium, cover the pot and cook, removing any foam that rises to the top, until the lentils are tender, about 30 to 40 minutes (mine took barely 30 minutes). Remove the pot from the heat and set it aside to cool for 15 minutes. Once slightly cooled, puree the soup until almost smooth using an immersion blender (if you have just a regular blender, use that, pouring the unpureed soup into it in batches, then pouring the pureed soup into its own separate pot). Add in the cumin, salt, pepper, and lemon juice to taste. Bring the soup to a boil over medium high heat, stirring frequently. Reduce the heat to low, and simmer until ready to serve. 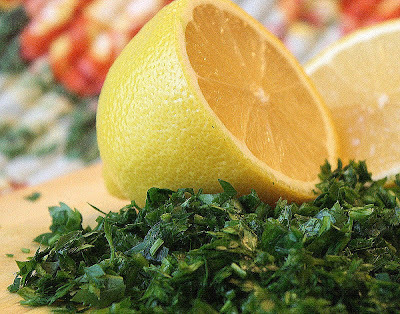 If you like, top each bowl of soup with a hefty pinch of chopped parsley and a wedge of lemon on the side. Blend together the flour, sugar, baking powder, and salt. 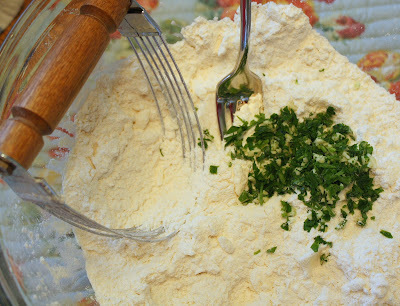 In a separate small bowl, mix together the parsley and garlic, then add that into the combined dry ingredients. Cut in the butter (I used a pastry blender) until the mixture resembles pea-sized pieces. Add in the buttermilk and milk, mixing just to combine. 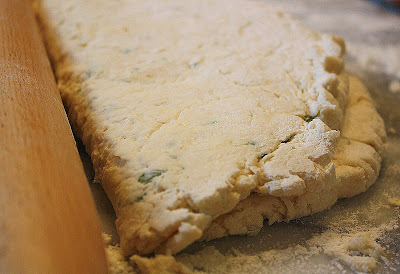 On a lightly floured surface, roll out the dough to a thickness of 1 inch. 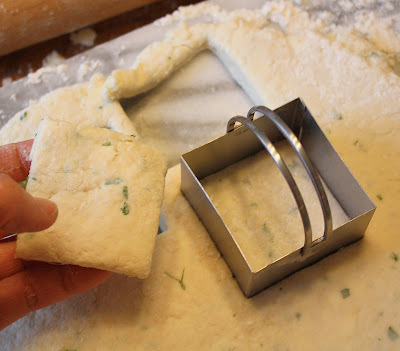 Fold the rolled dough in half, turn it, roll it, and repeat this 3 or 4 times for a final thickness of 1 inch. 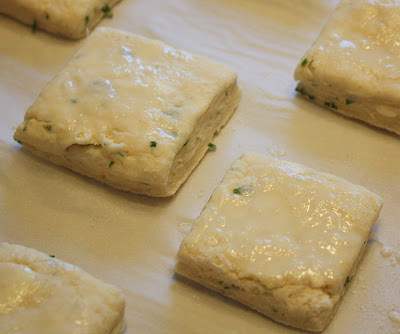 Place the dough pieces onto the covered baking sheet. With a pastry brush, lightly brush milk on the top of each one. Bake for approximately 10 to 15 minutes. Let the biscuits cool on wire racks, or serve them warm. Recipe full disclosure! This soup recipe came from the food section of the Detroit Free Press. I believe it was published in 2009, but I have no idea which month or day. I could not find the exact recipe on their website in order to confirm the date. At the bottom of the recipe that I have it says, "Adapted from Lila Amen, Dearborn. Tested by Susan M. Selaskey for the Free Press Test Kitchen." Post-Holiday Contentedness & the Rebel . . . So, did you survive the big day? I hope so. It's wonderful and all, but I'm kind of glad it's behind us. Not in a bad way or anything, but it's nice to have a few days to relax post-Christmas, don't you think? No fancy meals to worry about preparing, no more packages to wrap, no need to fret about getting all of those special tasks completed in a pressure cooker time-frame. In the holiday's immediate wake, I love having the opportunity to spend some extra time with my husband and kids, as we each wallow contentedly in the thoughtful and fun gifts we've received, with no imperative to rush about. I must say I was fortunate to be the recipient of some fabulous cookbooks this year. The one that I'd hoped Santa would bestow upon me most of all was Rose Levy Beranbaum's newest tome Rose's Heavenly Cakes; now that's a beautiful cookbook. She must have sold about a million copies of that baby in the last month alone, don't you think? Another one I'd been yearning for was The Craft of Baking by Karen DeMasco (also new this year and jam packed with luscious-looking possibilities), and last but not least The Perfect Scoop by David Lebovitz, a book that seems to be legitimately de rigeur these days if you're interested in making sensational ice creams and sorbets from scratch. Probably the most exciting item (for me at least!) that made its way into our household a couple of days before Christmas was a new camera, a DSLR from the Canon Rebel series. Not a present to ourselves exactly, but something that we'd wanted for a while but couldn't justify purchasing until we found it at an unbelievably discounted price. I'm just getting acquainted with the Rebel (I love having a camera that doesn't have a namby-pamby name) and there's a lot to absorb. I readily admit that I know very little about "real" photography, and I've stumbled along as best I can trying to take pictures that are worth looking at. I'd wager that at least ninety-five percent of the digital photos I've taken since I started this blog were not worth saving let alone putting into a post. Do you suppose it's like that for most amateurs who take pictures regularly? I don't know, but I'm hopeful, in any case, that that percentage will begin to change as I eventually figure out how to take full advantage of this camera's more advanced features. We shall see. The few photos you see in this post were taken today with my new friend, the Rebel. Will bake again soon. Talk to you later! If you'd like to comment on this post or to read any existing comments, just click on the purple COMMENTS below! Merry Mocha Streusel Bars . . . Someone stop me before I bake again. On second thought, please forget I ever said that (what was I thinking?). At Christmas time that kind of talk is heresy, don't you agree? I think you do. In fact, your unwavering agreement on this point means the world to me. Without it, I don't think I'd feel quite right about sharing today's tasty contribution to the Yuletide cookie platter--mocha streusel bars--and that would just be a shame. 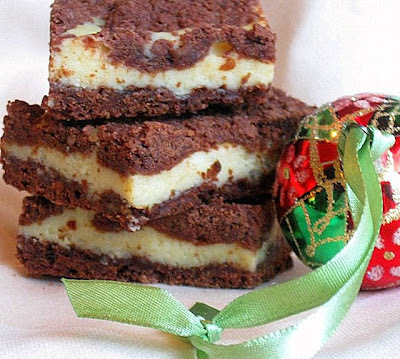 This is a minor variation on a cookie-bar recipe that my mom used to make once a year, without fail, at Christmas. We'd spend an entire mid-December day in her kitchen making perhaps eight varieties of cookies. My mom, my Aunt Lydia, sometimes my sister, and occasionally one of my cousins would be there, too. Just a bunch of girls. We'd have a regular production line going. It's still one of my favorite memories. We'd talk and laugh and drink tea and sample the cookies one by one. Can't buy memories like that in a store. The faded old index card that my mother typed out, decades ago, indicates she found this recipe in a print ad for Eagle brand sweetened condensed milk. The original is called simply "chocolate streusel bars." I changed it by omitting chopped nuts from the streusel, and by adding in a little bit of coffee to bring out the richer dimensions of the cocoa powder. Oh, and instead of using all regular unsweetened cocoa powder, I used half dutch-processed and half regular. You get way more flavor oomph from the dutch cocoa, and in a recipe like this, where acidity or lack thereof in the cocoa is not a factor that would have a negative impact on anything else in the recipe, why not use it? These bars need to be refrigerated for longer storage, but the flavor is best if they're allowed to come to cool room temperature before you serve them. Very, very good! Preheat oven to 350 degrees. Lightly spray or grease the bottom of a 9" x 13" baking pan. Line the pan with parchment paper so the edges come up above the sides of the pan (you'll use them as handles to remove the bars after they've been baked and chilled). In a large bowl, by hand, combine the flour, sugar, cocoas, and coffee. 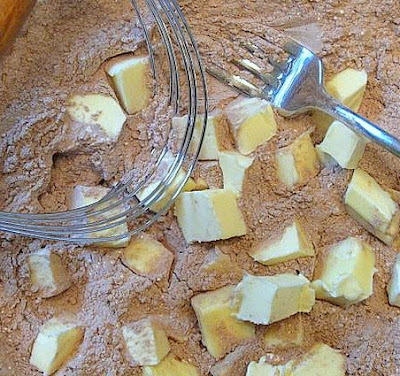 Cut in the butter pieces with a pastry blender until the mixture appears dry and crumbly, with no large chunks of butter remaining. Set aside 2 cups of this mixture. Press the remainder of the mixture on the bottom of the prepared pan. Press down firmly to compact the crumbs. Bake for 15 minutes, then remove from the oven and set aside. 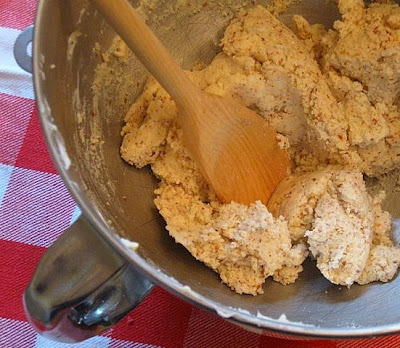 In the bowl of a mixer, beat the cream cheese on medium speed until fluffy and smooth. Gradually beat in the condensed milk. Add in the egg and vanilla extract and mix well. 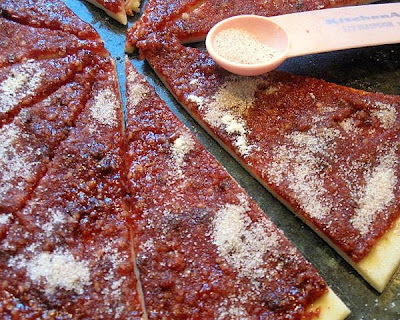 Pour this mixture over the baked crust and spread it out evenly. It will be quite fluid. Sprinkle all of the remaining crumb mixture over the top. Very gently pat the crumbs down just a bit. Bake for 25 minutes, or until slightly bubbly. Cool the bars in the pan, then chill them in the fridge for at least an hour. To remove the uncut bars from the pan, lift up firmly on the parchment. Slice the bars with a very sharp knife. Store them, well covered, in the refrigerator. These bars freeze really well. 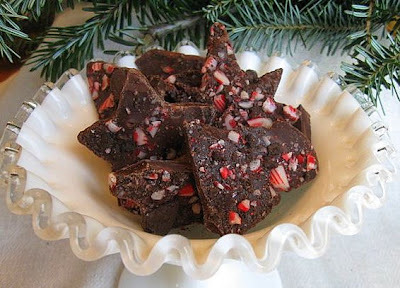 Double Chocolate Cookie-Crumb Peppermint Bark . . .
Have you ever used peppermint oil in a recipe? Natural peppermint oil versus peppermint extract, I mean? I think it's a little like the difference between the taste of a really good candy cane and the taste of toothpaste. If you're going to use one or the other in a chocolate-based recipe I recommend a few drops of the oil. Tiny little bottles of flavoring oils--some natural and some artificially flavored--can be found in stores that sell candy-making and cake decorating supplies. Like miniature bottles of perfume, flavored oils are measured in drams and come in all varieties. They're just about as strong as real perfume too, so you don't want to spill this stuff! Bark can literally be made in minutes and anyone can do it. 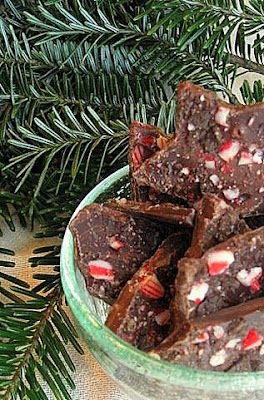 For this simple festive treat I used one bag of Ghirardelli bittersweet chips and one bag of their milk chocolate chips. I melted the two types of chips in separate bowls and gently stirred until they were each completely smooth. Then I added two or three drops of Lorann brand natural peppermint oil to each bowl and mixed that in. Next, I poured the two chocolates, in alternate spoonfuls, all over a very lightly sprayed (with the smallest amount of a vegetable spray, like Pam) flexible plastic sheet that I'd placed on a cookie sheet with sides. I quickly spread the chocolate evenly over the sheet with an offset spatula, casually swirling it together. How easy is that? So easy, I'm not even sure it has the right to call itself a recipe! P.S. Store your bark in the fridge, in a well sealed container, so it doesn't get too warm and it's not exposed to odors from other foods. And the Christmas cookie parade marches on . . . here comes another one! 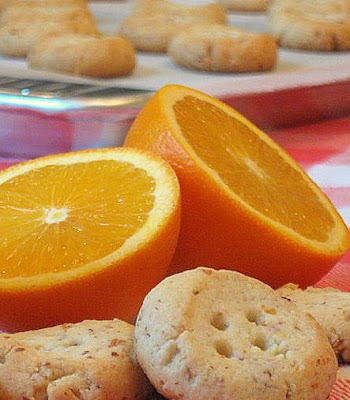 These unassuming little cookies are crisp, almondy, and permeated with the delicate zing of orange zest and fresh-squeezed orange juice--the perfect partner to a hot cup of Christmas tea. Adapted from a recipe called Lime Pecan Butter Cookies in the book Simple American Cooking by Chuck Williams (of Williams- Sonoma fame), I chose to substitute the fruit and nut of my choice. In addition to that, I thought they looked remarkably like diminutive buttons, and we all know that buttons require button holes. I did a little rewording of the instructions, and I added the possibility of a sweet orange glaze to top them off. The base recipe is kind of unusual for a butter cookie in that it contains an egg white and it undergoes quite a long period of beating before the flour is added in. It's not rich in the way that shortbread is, but it does have a subtle buttery quality that's just right. 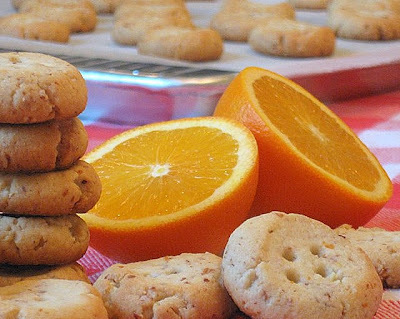 If you prefer a sweeter version than just the plain cookie, you can ice it easily with a quickly made glaze of confectioners' sugar and fresh orange juice. Mmmmm . . . In a bowl, sift together the flour, cornstarch, and salt. Set aside. 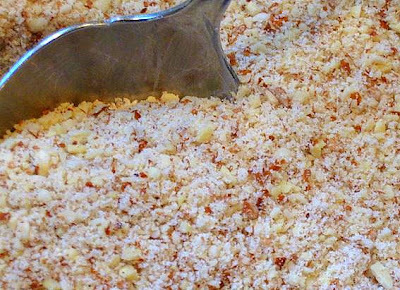 In a food processor fitted with the metal blade, combine 1/4 of the sugar and all of the chopped almonds. Pulse until finely chopped. Set aside. 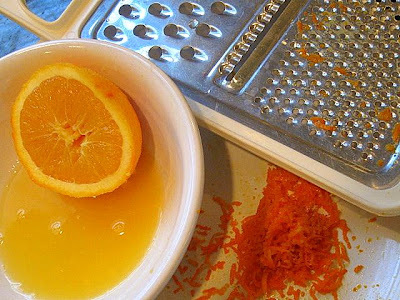 Using the fine holes of a grater, grate off the zest of the entire orange. Cut the orange in half and squeeze out the juice (remove any seeds). Set the zest and juice aside. 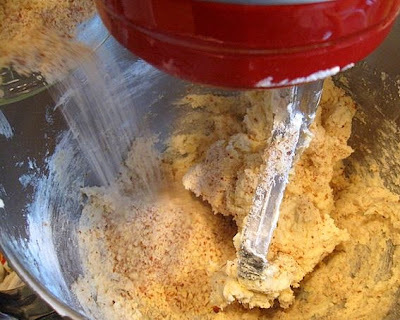 In the bowel of a mixer, combine the remaining sugar and the butter and beat on medium speed for about 5 minutes, until light. Add in the egg white, all of the zest, and about 2/3 of the orange juice. Continue beating on medium speed until fluffy, 8 to 10 minutes. 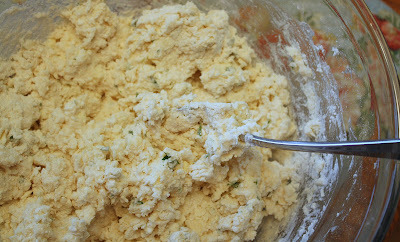 Scrape the sides of the bowl as needed. Reduce the speed to low and carefully beat in the flour mixture, a little at a time. Add in the ground almonds and beat until well blended. 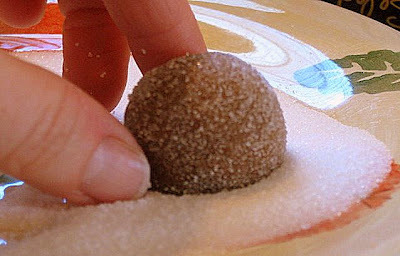 Make balls of dough about 1" in circumference. Place the balls on your parchment-covered cookie sheet about an inch apart and press your thumb down across each one. 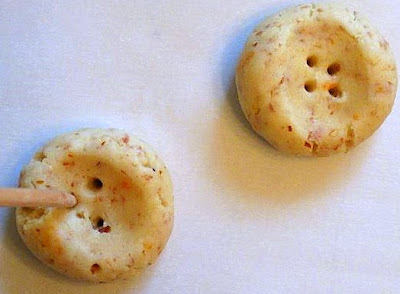 Using a pointed skewer, poke four little holes in each one, just as they'd be placed in a button. Bake until they start to turn lightly golden around the edges, 12 to 18 minutes. Let the cookies cool on a rack. To make a thin glaze: In a small bowl, stir together up to one cup of confectioners sugar and the remainder of the orange juice. Adjust the thickness as you prefer by adding more or less juice. If it's thin enough, it's easy to simply pour it over each cookie if they're placed on a rack over a cookie sheet with sides. Let the glazed cookies sit out to dry for half an hour or so before storing them. 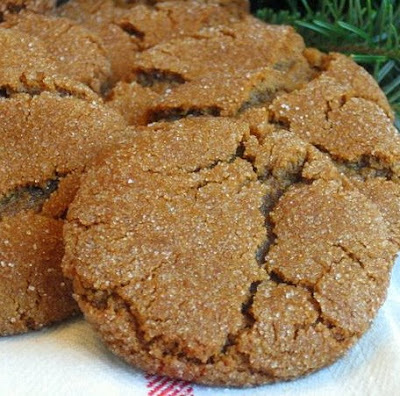 That's a Cookie with Character: Robust Molasses Cookies . 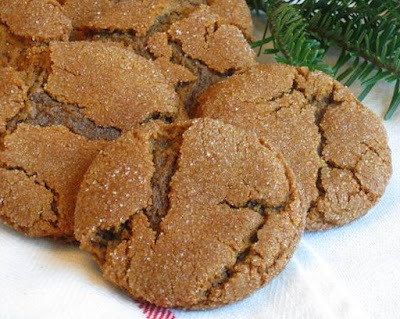 . .
My hubby says he loves molasses cookies, which I, for some unknown reason, barely ever remember to make for him. The recipe below, which I zealously ripped from the latest Penzey's spice catalog, is a really, really good one. 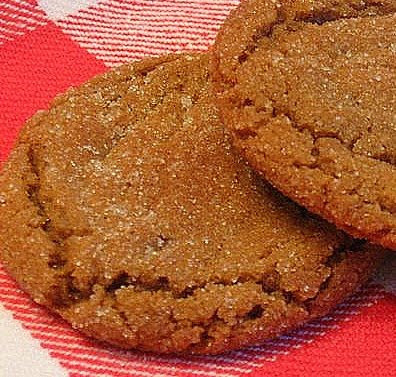 With a great combination of warm complex flavors, it somehow has more character than a typical molasses cookie. What kind of character am I talking about? Well, if this cookie could help a little old lady cross the street, I think it would do so without hesitation. One might say it's an Eagle Scout of a cookie, and that's exactly the kind of character you want in a molasses cookie--am I right? If you want these cookies to be a bit soft and chewy, bake them the absolute minimum amount of time. I found that there's an extremely fine line here between raw-on-the-inside and baked-just-long-enough to make them come out chewy but not too crunchy. My intention was to go for chewy, but the first couple cookie sheets I baked were in the oven just a wee bit too long. Crunchy or chewy, though, they will be delicious. To the melted, cooled shortening add the sugar, molasses, and eggs. Beat well. the wet ingredients, mixing with a spoon (or on the lowest speed with your mixer, which is what I did) to incorporate. Chill the dough for at least an hour or more. Preheat oven to 375°. Using about a tablespoon of dough, form into balls. Roll in sugar and place on ungreased cookie sheets lined with parchment, about 2 inches apart. Bake for 7-9 minutes. Check at 7 minutees. You want them to flatten out but still be soft. Let the cookies cool for 1-2 minutes before removing them from the pan. Recipe full disclosure! -- This recipe appears in the December 2009 Penzey's spice catalog and is credited to Linda Aukerman of Findlay, Ohio, who notes that it is "an old family recipe that we've been making for years." 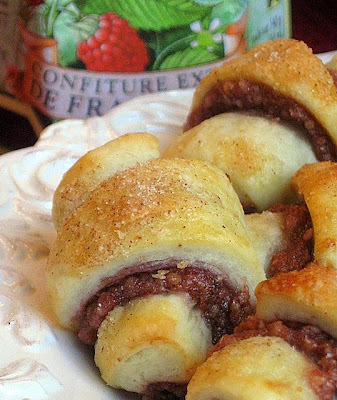 Raspberry Rugelach . . . and that's just for starters! Until this morning, I hadn't yet put my own cookie-making pedal to the metal (forgive the mixed metaphors . . . you know I how I love to mix things). I am obligated to crank out a lot of cookies over the next few days. A few dozen for a church fundraiser, probably at least eight dozen for my husband's office holiday event, not to mention cookies to keep at home and freeze for the actual holidays themselves. Oh, and can't forget some for my 82-year old dad and my older brother. And let's not leave out my sister, Joanie, who has an annual craving for our late mom's old thumbprint recipe. She'll be blowing into town from Connecticut on the 23rd (she's always been one to cut it close). Got my work cut out for me . . . I waded buoyantly into the cookie-making fray at 8:00 a.m. this morning, mere minutes after my youngest son left for school. Clutching a recipe for raspberry rugelach, I felt compelled to get my foot in the holiday-cookie door largely because I knew I could throw the dough together really quickly, toss it in the fridge for its mandatory chill, and then go about the business of my non-baking life for a while and do the assembly and baking later on today (yes, I do sometimes engage in non-baking related pursuits, contrary to popular belief; woman does not live by baked goods alone, you know). 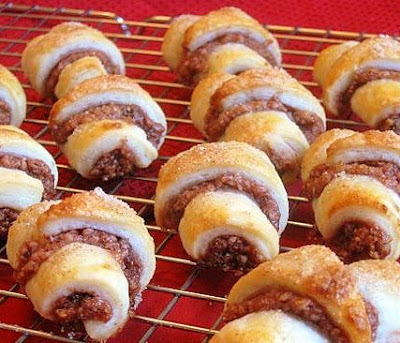 As for the particular recipe that I chose, I read through a handful of them for rugelach last night and thought this one seemed a little more logically structured than the others. It's from the book Baking at Home with the Culinary Institute of America. (This is a great resource; the very first blog post I did was for blueberry muffins, from this book, and they were exceptional.) I made no changes at all to the formula. It sounded really good to me as is. I did, though, do some of my usual editorializing in the instructions, along with a little rewording here and there. I'm glad I picked this recipe because the combined flavors meld together beautifully. 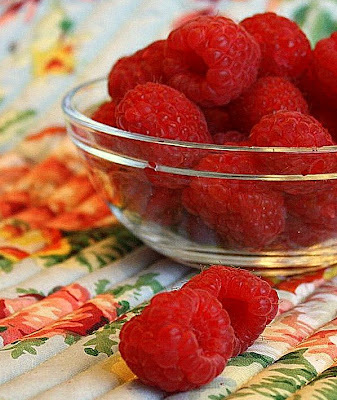 We have raspberry (always a hit), a barely perceptible hint of chocolate (who could complain? ), pecans (yeah, like those too), and cinnamon (nothing negative to say about cinnamon . . . it's so lovable). 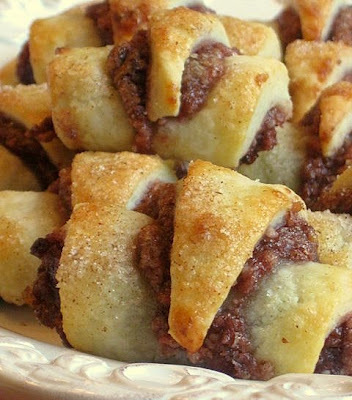 Rugelach is actually a pretty simple item to make, but it looks deceptively time consuming. 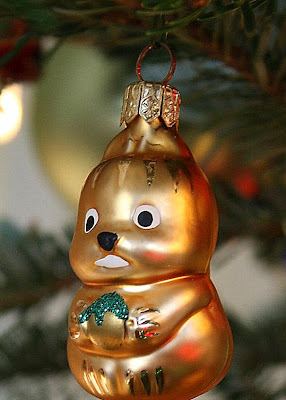 That kind of deception is a good thing at Christmas. It gets you way more "ooohhs" and "ahhhhs" than a run o' the mill sugar cookie (though I have nothing against those either . . . you guys know I don't discriminate). So go ahead. No more procrastinating. 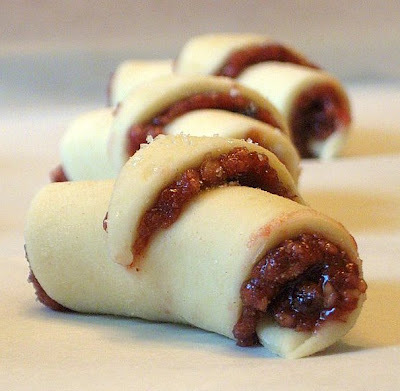 Get your cookie engine running and go make some rugelach! Sift the flour and salt into a bowl and set aside. 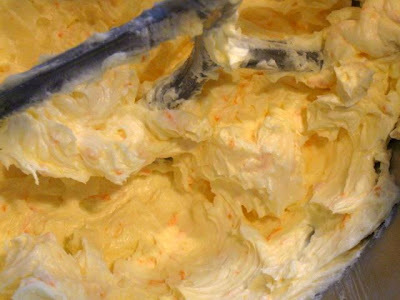 In a mixer, using the paddle attachment, cream together the cream cheese and butter on medium speed for about 2 minutes. 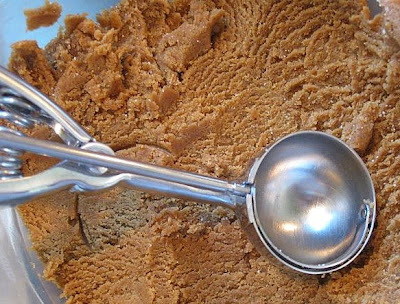 With the mixer on low speed, mix in the dry ingredients just until combined, scraping the bowl as needed to evenly blend. Tightly wrap the dough and chill it for 15 to 20 minutes, or until it's firm. Roll the dough out on a lightly floured surface until it's 1 inch thick all over. Fold the dough over into thirds, like you'd fold a letter. 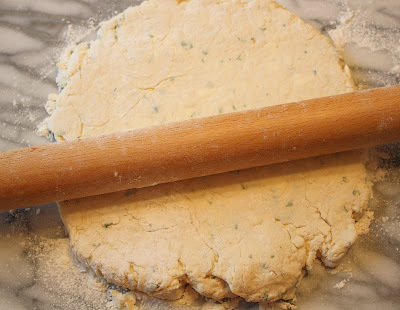 Wrap the dough and chill it for at least 1 hour, and up to 24 hours. 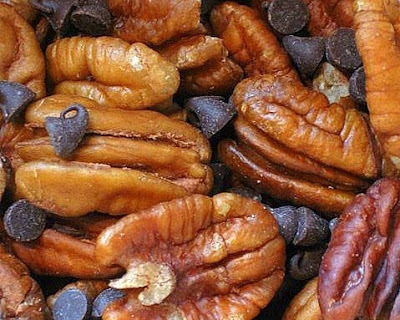 To prepare the filling, combine the pecans and chocolate in the bowl of a food processor. Pulse repeatedly until the mixture forms a coarse paste. (I pulsed until a bit of it held together when I pressed with my fingers; it was not truly like "paste" for me, but it worked just fine the way it was.) 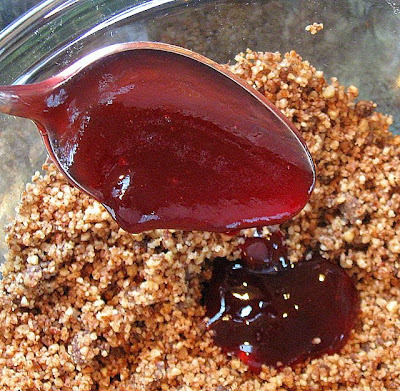 Dump it all into a bowl, add in all of the jam, and stir until it's well combined. When you're ready to assemble and bake, preheat your oven to 375 degrees. Line your cookie sheets with parchment paper. Divide the chilled dough into 4 equal pieces. Return three of them to the fridge while you work on the first one. On a lightly floured surface, roll the dough into a 10" circle. Spread 1/4 of the filling evenly all over the circle, extending almost right up to the edge. Sprinkle 1/4 of the cinnamon sugar evenly over the filling. Cut the circle evenly into wedges; 16 if you want very small rugelach, 12 if you'd like them slightly larger (I used a sharp pizza wheel to cut them; I made mine into 12 wedges and they were still small). Roll the wedges up, starting at the wide end. Curve the ends in slightly, like a crescent, if you wish. 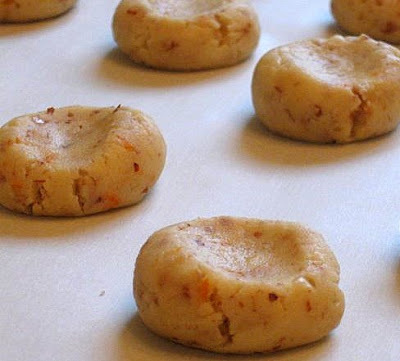 Place them on your lined cookie sheet. Brush them gently with the egg wash, and sprinkle each one with cinnamon sugar. Bake them until light golden brown, for approximately 25 to 30 minutes (mine only took about 22 minutes). 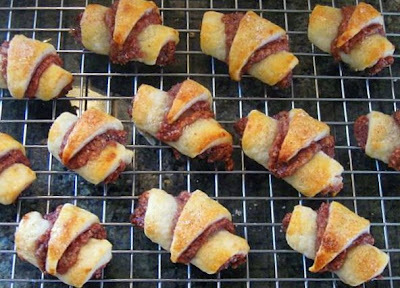 Transfer the finished rugelach to wire racks and cool them completely before storing or serving them. Recipe Index . . .
Just click on that slice of brie cheesecake with strawberries, above, to get to the Recipe Index! Jane's Sweets & Baking Journal was born of my ever increasing desire to learn more about the baking and pastry arts, and of my love for anything and everything related to baking. Just as food is meant to be shared, so is knowledge among bakers and among those who enjoy delicious foods prepared from scratch. So, please partake, and feel free to share your thoughts and comments. I'd love to hear from you. If you'd like to know a bit about me please click here, or look for the tiny photo of a pink cupcake topped by a strawberry, further down, in the "About me" section. You can also reach me by email at janessweets@gmail.com . . . Subscribe to Jane's Sweets . . . Follow Jane's Sweets by Email! Follow along with Jane's Sweets & Baking Journal! Winter Loves Sweet Potato Pound Cake . . .
. . . this one's a classic. Really. English Apple Shortcake . . .
. . . Don't you just adore apples? I do. 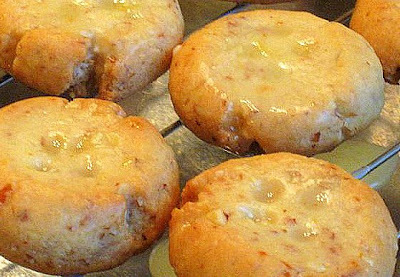 Nibble on a Hearty Apple Oatmeal Scone . . .
. . . with your breakfast this weekend. That's my advice. Cinnamon Raisin Bread . . .
. . . You can make this. It's easy. I wouldn't lie about a thing like that. These classic cinnamon rolls are . . .
. . . simply sensational. Save up your calories for these babies. Bake the best apple pie . . .
. . . you've ever imagined. Brown Sugar Pound Cake . . .
. . . with sauteed apples and cinnamon whipped cream . . . yum. Jane's Favorite Baking/Food Blog(s) of the Day (or every few days) . . .
Parmesan, Herb, & Garlic Popovers . . .
. . . they're just the best. This is what little popovers want to be when they grow up. Buttermilk bread . . .
. . . makes superlative French toast. It's a fact. Strawberries & Cream in Muffin form . . .
. . . the muffin of your dreams!
. . . flavors that were made for each other! Brown Sugar Buttermilk Muffins . . .
Lattice Cherry Pie . . . Learn How to Make Whimsical Tuile Cookies . . .
. . . using your own handmade stencils in any shapes you like! A photo tutorial.
. . . you won't want to awaken from this dream!
. . . made with a bit of coconut and a splash of rum! Fluffy pumpkin muffins . . .
. . . made with coconut and pecans. 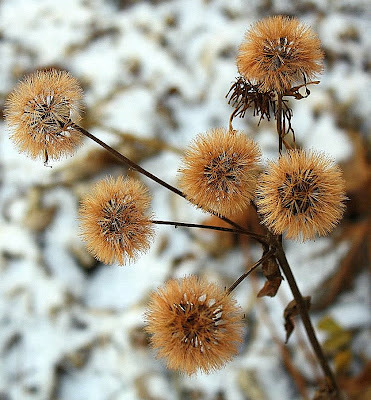 A wintery treat! Cream Cheese Blondies with Milk- and Dark-Chocolate Chips, and Honey Roasted Almonds . . .
. . . . they're so lovable. Need a great Italian bread recipe? This one has a crust that's fragrant with herbs and garlic . . . it's easy, reliable, and really tasty. Leave the bagel . . .
. . . take the bialy! All year long, lazy mornings require . . .
. . . big, warm, blueberry muffins. Espresso Chocolate Chip Pound Cake . . .
. . . is always in style. An interesting variation on cherries jubilee . . .
. . . made with Grand Marnier, sweet black cherries, pomegranate juice, and homemade vanilla ice cream. Dutch apple cake . . .
. . . it's divine! What We Talk About . . .
. . . When We Talk About Banana Cake! About Professional Baking: The Essentials, by Gail Sokol. This is a textbook, but not one that's intimidating. It contains lots of useful info, including interesting personal profiles of professional chefs. All-American Dessert Book, by Nancy Baggett. Wonderfully detailed, with very reliable recipes, Baggett does it again in this valuable cookbook. Definitely worth your time! Art & Soul of Baking, by Cindy Mushet. This large Gourmet Cook Book Club Selection is a feast for the eyes. I love the page layout, the photos, and the author's reassuring tone. Recipes range from the quotidian ("classic sugar cookies") to the ridiculous ("Moroccan-spiced sweet-potato tiropetes") to the absolute sublime ("duo-tone chocolate pots de creme"). Worth acquiring. Baking and Pastry: Mastering the Art and Craft, by the Culinary Institute of America. This is a heavy duty textbook, not for the faint of heart. Intimidating, sure, but also kind of fascinating if you're an obsessive bake-a-holic like me. Baking at Home with the Culinary Institute of America. This book contains one of the best blueberry muffin recipes I've ever encountered. A truly comforting and approachable alternative to the CIA's enormous baking textbook (listed just above). Baking From My Home to Yours, by Dorie Greenspan. I love Dorie's writing style and companionable way of sharing her knowledge. A book you can sink your teeth into. Worth owning! Baking in America: Traditional and Contemporary Favorites from the Past 200 Years, by Greg Patent. This James Beard Foundation award winner is much more than just an engaging cookbook. It's an historical retrospective/survey of baking lore and techniques. Charming and quaint, peppered with maxims and admonitions from stern cookbook writers of yesteryear. Betty Crocker's Picture Cookbook, published in 1950 and available in a facsimile edition, holds a special place in my heart. This is the book my mom primarily used, or so it seemed, when I was a kid. The photos are such period pieces, and the little notations that accompany recipes are pricelessly cute and corny. I have an ancient copy that I still use. Every girl needs a copy of this in her house, for good karma if nothing else. Bitter Sweet -- Recipes and Tales From a Life in Chocolate, by Alice Medrich. Much more than just a cookbook with a focus on fine dark chocolate, this is also a memoir of sorts from a legendary chocolate-dessert creator. Medrich is often credited with awakening American tastes to the finest aspects of superior chocolate. Very interesting read! Bread: A Baker's Book of Techniques and Recipes, by Jeffrey Hamelman. An indispensable book for anyone who is seriously interested in learning to make fine yeast breads, Hamelman shares far more than just technical knowledge. Like fellow bread guru Peter Reinhart, his warmth of spirit and deep love for the tradition of bread baking shines through on every page. Breakfast Book, by Marion Cunningham. Not to be confused with the character of the mom on Happy Days, the real Marion Cunningham has a long list of writing accomplishments, the most well known being that she completely revised The Fannie Farmer Cookbook. A contemporary of the late James Beard's, she is still held in high esteem. Cake Bible, by Rose Levy Beranbaum. Rose is really into the science of baking, which can be helpful in some respects and off-putting in others. Like gardeners who talk mostly about soil components without conveying their joy in the plants themselves. Maybe I'm too sensitive? Probably so, as many consider this to be an invaluable classic. Despite my reservations, I wouldn't part with my copy. One of several highly detailed books by Rose. Her latest book, Heavenly Cakes, is much more down to earth, loaded with photos, and truly beautiful. Cake Book, by Tish Boyle. I've called it a treasure trove before and please allow me to say it again here. This book is jam packed with wonderful stuff that's well explained. I used the Sacher-torte recipe in the fall of '09 for a culinary school project and it didn't let me down. I can endorse this book without reservation. I love it. Chocolate: From Simple Cakes to Extravagant Show Stoppers, by Nick Malgieri. Beautiful photos for a wide variety of desserts and sweets. Malgieri never steers one wrong with his exceptional and reliable recipes. Complete Book of Pastry Sweet & Savory, by Bernard Clayton, Jr. When this book appeared in 1981, famed food editor Craig Claiborne praised it in the NYT as "one of the most important cookbooks of this year, if not of this decade." No photos, but don't let that dissuade you. Cookie Craft: From Baking to Luster Dust, by Valerie Peterson & Janice Fryer. Very good recipes for this type of cookie and lots of cute design ideas. Craft of Baking, by Karen DeMasco & Mindy Fox. In 2009, some great new cookbooks were published and this was one of them. Down to earth, straightforward without being condescending, this smart guide offers creative and simple twists on dozens of diverse and well-proven "cakes, cookies, and other sweets." 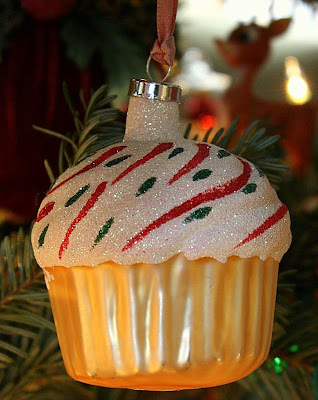 Creative Cookies: Delicious Decorating for Any Occasion, by Toba Garrett. She's the queen of high-end decorated cookies. Good recipes for decorator icings. 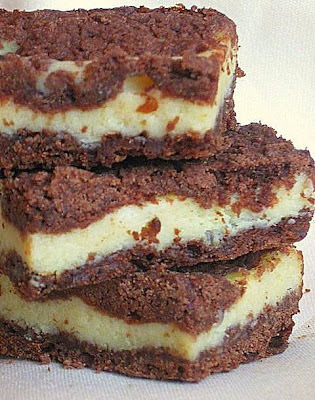 Dessert Circus: Extraordinary Desserts You Can Make at Home, by Jacques Torres. Famed pastry chef and chocolatier Torres shows off his expertise and his wonderful whimsical side in this great book. Lots of fun to peruse, highly readable, and completely enjoyable. Dessert University, by Roland Mesnier. As the White House executive pastry chef for over two decades, Mesnier has a lot of wisdom to impart. He does so well in this book, which is designed specifically for home bakers. A good book! Desserts by the Yard: From Brooklyn to Beverly Hills--Recipes from the Sweetest Life Ever, by Sherry Yard. Acclaimed pastry chef Yard shares her story, along with dozens of exquisite recipes, in this engaging and beautiful book. Exceptionally well designed and composed, the book is a treat in and of itself, while the recipes are a unique amalgam of tradition and creative innovation. Good Cookie: Over 250 Delicious Recipes from Simple to Sublime, by Tish Boyle. 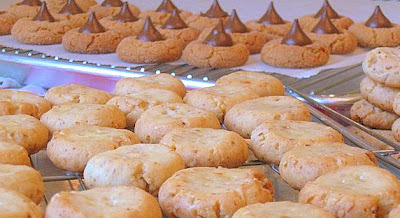 A great source for reliable cookie recipes from a wonderful pastry chef and writer. Check out her Cake Book too--beautiful! Grand Central Baking Book, by Piper Davis and Ellen Jackson. Readers are welcomed into these pages with a tone of warmth and familiarity. The photos alone will have you scribbling a grocery list. Try the berry kuchen recipe--simple and scrumptious. Hershey's Chocolate Treasury, published in 1984 by Hershey Foods and chock full of old reliables. The recipe for Black Magic cake is one I've used again and again--invaluable! How to Bake, by Nick Malgieri. The writing style is matter of fact and fairly informal. That's one of my favorite things about Malgieri's books. In the Sweet Kitchen: The Definitive Baker's Companion, by Regan Daley. A fine book that won the IACP Book of the Year a few years ago. Great reference to have around. Kate's Cake Decorating: Techniques and Tips for Fun and Fancy Cakes Baked with Love, by Kate Sullivan. One of my favoite cake deco books of all time. Great designs, from not-so-hard to you'd-better-block-out-at-least-a-week! King Arthur Flour Baker's Companion. The recipes are detailed and extremely reliable. King Arthur hasn't let me down yet. King Arthur Flour Whole Grain Baking: Delicious Recipes Using Nutritious Whole Grains. You can do a lot with non-white flour and this book proves it. A great recipe in here for a peach bread flavored with nutmeg--delicious! Magical Art of Cake Decorating, by Carole Collier. Sometimes at a used book sale you find an old gem like this. Published in '84, I found it very encouraging when I first began decorating cakes. The recipes are rock solid reliable. Maida Heatter's Book of Great Chocolate Desserts, by Maida Heatter. Famed baker (apparently her "Palm Beach Brownies" are known far and wide), whose work has centered on wondrous chocolate desserts, Heatter received a James Beard award for this book, one of many she's published over several active decades. Martha Stewart's Baking Handbook, by Martha Stewart. Beautiful photos, but I must admit I've come to have reservations about the reliability of some of the recipes. Is it just me? Though I love flipping through the book for ideas, I'm a bit on the fence with this one when it comes to actual usage. Martha Stewart's Wedding Cakes by Martha Stewart. Talk about a stunning and inspiring book! Chances are you may never decide to actually make one of the cakes from this glorious volume, but it's enough just to page through the gorgeous pictures and interesting recipes. Expensive? For sure, but worth it. Passion for Baking, A by Marcy Goldman. If you're curious about how professional bakers manage to make things come out nicely every time, you'll appreciate this book. Goldman, in her highly approachable style, divulges many of their simple--but enormously helpful--tricks and techniques, and shows readers how to implement them throughout the wondrous array of down-to-earth recipes that pack this great book. Loads of enticing photos, too! I love this book! Pastry Chef's Companion: A comprehensive resource guide for the baking and pastry professional, by Glenn Rinsky & Laura Halpin Rinsky. A paperback desk reference, very handy. Perfect Cakes, by Nick Malgieri. Can't say enough about Malgieri's books. Absolutely worth using, versus just reading! The white and dark chocolate cheesecake is to die for; I've made it a few times, along with many other recipes from this book, and it is superb. Peter Reinhart's Artisan Breads Everyday, by Peter Reinhart. This book is a revelation for anyone who approaches yeast recipes like a vampire approaches the dawn. Talk about down to earth, encouraging, and flexible! This guy knows how to talk to rookie breadmakers. Well worth reading, and using, this volume will find a comfy place in your cookbook collection--a worthwhile purchase, undoubtedly! Professional Cake Decorating, by Toba Garrett. I get the impression that this book is perceived as the most thorough and comprehensive text available for serious students of cake decorating. This is the text that we used for my culinary school Beginning Cake Decorarting class (which means I finally own my own copy!). Secrets of Baking, by Sherry Yard. A must have, bakers! This cookbook's forte is the way it's organized; master recipes are presented with full explanations of how they can be used, and related recipes follow, section by section. An exceptional manual to refer to. Get your own copy! Sky High: Irresistible Triple-Layer Cakes, by Alisa Huntsman and Peter Wynne. Huntsman is the professional pastry chef behind this beautiful book, filled with many tempting recipes, all designed specifically and scaled perfectly for three layers. I've made the Devil's food cake thus far, and it was exceptional--it rose well, was very moist, and had great depth of flavor. I'll be using this book more in the future, without a doubt. Love the photos also! Pour a nice hot cup of coffee or tea & meet me . . .
. . . in a peaceful corner . . .
Amy Atlas, The Blog -- Amy Atlas is an inspired and enormously creative event planner, who shares a gold mine of fabulous food-presentation and entertaining ideas in this site. Gorgeous photos of baked goods, candies, etc. Absolutely worth visiting! Arty McGoo -- The blog's name is funny, but don't let that throw you. 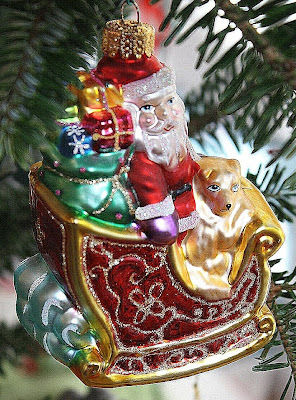 This site's the brainchild of one Elizabeth Adams, whose artistry with decorated cookies is really quite astounding. This woman's going places! Bake or Break is the site of a self-proclaimed "amateur baker," with lots of good-looking recipes and interesting food-related links. Bakerella -- Wonderful photos in a fun site. And if you want to know how to customize Easter "peeps" to look like Pikachu, search no further! Baking 911 -- Just what it sounds like! A vast and varied storehouse of baking info! You may find answers to all sorts of queries here. BBC Good Food -- Are you familiar with this great British food magazine? The mag's website is pretty great too. I always put a copy of their special Christmas issue in my hubby's stocking, at his special request. It's wonderful! Betty Crocker, though not hip or cool (and never cutting edge, which is fine with me), holds a nostalgic place in my heart. Reminds me of my childhood baking experiences with my mom and aunts. Don't turn up your nose! Let's face it-- there are lots of very solid recipes in some of these corporate-giant sites. Bread Bakers' Guild of America -- Loaded with interesting links for serious bakers, the BBGA exists to shape the "knowledge and skills of the artisan baking community through education." Cake Journal, charmingly presented, is a good source for instruction, ideas, and inspiration. Cakespy -- All about what we love! Can You Stay for Dinner -- Of particular interest to anyone who has had a long struggle dealing with weight, this sensitive, funny, and beautifully composed blog is written by a young woman with great insight, great recipes, and enormous writing talent. One of my new favorites. Chef 2 Chef -- A great culinary portal for chefs, culinary students, and anyone who loves to read, or talk, about cooking. Tons of links and more info than you can shake a rolling pin at! Cooking With Amy -- The blog of food writer, recipe developer, and cookbook author Amy Sherman is visually appealing, ad-free, and packed with good stuff--articles, reviews, recipes, great photos, you name it! Cream Puffs in Venice -- A wonderful blog, full of interesting articles, links, stories, recipes, and photos. The author's voice is warm and welcoming. If you've never visited this award-winning site, you'd better make time to do so! Culinary Institute of America -- This site is laden with links that are worth visiting. The focus goes well beyond the Institute's course offerings. Check out their daily emailed ProChefSmartBrief, a free subscription-based e-newsletter. David Lebovitz: Living the Sweet Life in Paris -- Renowned pastry chef (he's worked with some pretty big names), memoirist and cookbook author (check out his ice cream book, The Perfect Scoop, among others! ), and American expat living in France. You should really visit this blog if you love baking at all. Dorie Greenspan -- This is Dorie's own blog, filled with her musings, recipes, etc. It's everything you could hope for if you're a fan of this award-winning pastry chef and cookbook author. Fancy Flours -- An online retail source of unusual accessories and ingredients of particular interest to cake decorators. I've seen items in this site that I've never seen for sale anywhere else! Food52 -- The brainchild of food-writing luminary Amanda Hesser and professionally trained chef Merrill Stubbs, Food52 was named Best Publication of 2012 by the James Beard Foundation! An impressive site that emphasizes truly delicious home cooking over pretentious exotica. Worth the visit! Fresh -- Completely-stunning-blog alert! This one is so beautiful. The photos alone are worth the trip. I love Fresh. Great links within it as well. Glorious Treats -- And, oh my gosh, are they glorious! The creativity and talent behind this blog come bursting out of the screen. The work is exceptional, the photos a pleasure, and you'll come away filled with great ideas. Check it out! Goddess of Bakedom -- The blog of Sarabeth Levine, pastry chef extraordinaire and owner of NYC bakeries. Her entire website is a nice place to visit. And have you ever seen her gorgeous cookbook? How Sweet It is -- What a perfect title for a really fine baking/dessert blog. See for yourself! Joe Pastry -- Good stuff here, with a focus on baking history and science. Visually appealing and cleanly presented. King Arthur Flour's site is a gold mine of fine reliable recipes with detailed instructions and photos; I love this site. If you have a question about a recipe they'll respond to your query quickly. I wish King Arthur was HQ'd in Michigan! La Tartine Gourmande -- Beautiful, beautiful, beautiful, and more beautiful. Even if you never read the posts or the recipes in this site, you will love the photography. Don't miss this site! Michael Ruhlman: Notes from the food world -- Are you familiar with the writing of Michael Ruhlman? No? Well, if you've never gotten your hands on his nonfiction book (one of several he's written) The Soul of a Chef, you really must do so. That's all I have to say about it. Read his book(s) and you'll want to visit his blog. Modern Baking -- An interesting site devoted to the baking/bakery industries. A pretty diverse range of info in this site provides a broad look at the professional side of things. Some fascinating stuff to be found here if you're curious! Nancy Baggett's Kitchenlane -- This is the site of one of America's most trusted and reliable sources for delicious well-tested recipes. The tone of Nancy Baggett's writing is friendly and instuctive, and she always includes just the right amount of detail. Her books are the source of many of my favorite recipes. Worth visiting! Nick Malgieri is an exceptional pastry chef and cookbook author; he's also an educator. I love his recipes and I greatly appreciate his matter-of-fact writing style (guess it's the old editor in me!). 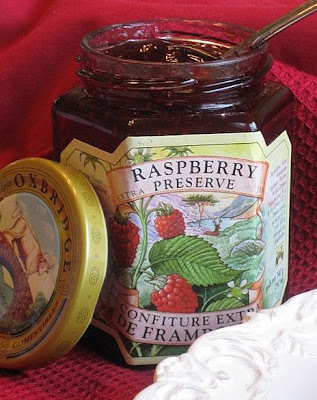 Orangette is the blog of professional food writer Molly Wizenberg. Her book, A Homemade Life, is well worth reading. I just loved it. She and her hubby own a couple of small eateries in the Pacific Northwest, so she has a unique perspective. Passionate About Baking is a feast for the senses, created by a SAHM in India. Beautiful site, brimming with wonderful info, recipes, and links! Pastry Channel -- Are you familiar with Tim Fonseca? He's a pastry chef with his own "channel" on YouTube. Worth visiting. Also a regular related website, if you're not into YouTube (yet)! 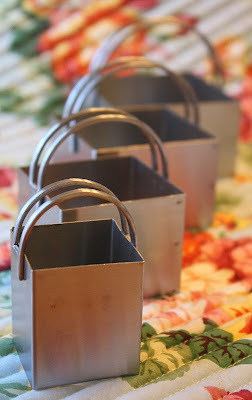 Pastry Studio -- Ingriguing recipes with beautiful photos, this is a blog uncluttered by the extraneous. Well written posts too! Pioneer Woman -- This fun and colorful mega-site covers a lot more than just cooking, but the cooking part is intriguing enough in and of itself. Good photos abound! Quenelle --- Blog of professional pastry chef and CIA pastry instructor Francisco Migoya. 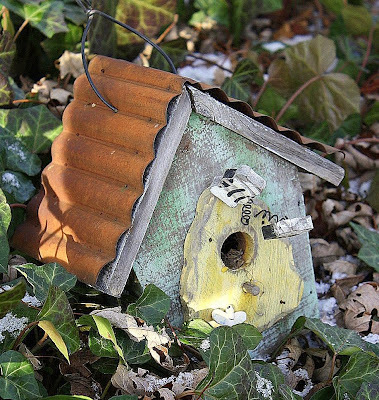 Spare, clean, and no frills to clutter things up, this blog imparts interesting techniques and gets your creative juices flowing. Check it out! San Francisco Baking Institute -- Along with info on the courses offered, this site houses numerous resources of use to bakers everywhere, including bakers' tips, recipes and formulas, definitions of terms, and so on. Check it out! Saveur -- The site of the food magazine of the same name (yes, a print magazine that's still alive!) that's apparently doing pretty well despite the economy, even on the heels of Gourmet's closure. Their website--loaded with articles, recipes, and useful links-- is bright, busy, and well worth visiting. Smitten Kitchen -- If you've never dropped in on Smitten Kitchen, well, you just gotta go there right now. Very popular site, not pretentious, just chock full of real-life recipes and great photos. Don't miss it! Sweet Adventures of Sugarbelle -- The best cookie-decorating site I have found. Jam packed with fantastic ideas, exceptionally clear tutorials, and a great resource for techniques, recipes, and ideas. Not to be missed if you are at all into cookie decorating! Sweetapolita -- A luscious feast for the eyes, this site belongs to a talented and entrepreneurial cake designer, with fantastic photographic skills to boot. I LOVE it! Tartelette is a truly beautiful baking blog, from a French pastry chef in the U.S. who is currently working on a cookbook. She does all her own photography and the word "stunning" doesn't begin to describe it. Don't miss this one! The Fresh Loaf -- News and info for amateur bakers and artisan bread enthusiasts! This is the first place I turn when I have specific questions that need specific answers from bakers who've been there! Tish Boyle is a fabulous cookbook author and pastry chef. Her books are filled with well-tested recipes and are very much worth purchasing. This is a beautiful, entertaining, and informative blog. I highly recommend it! Tuesdays with Dorie is a site devoted to the recipes of wonderful baker and cookbook author Dorie Greenspan. Members commit to baking two or more of her specific recipes each month and report on their results. Interesting concept! Will Write for Food -- The blog of Dianne Jacob, author of the definitive food-blog writer's guide of the same name -- food for thought and how! Wilton's site is chock full of reference info and ideas of particular interest to cake decorating hobbyists, especially those just getting their feet wet. Want to visit my FoodGawker gallery? Click on the picture! Hey, Everybody Needs a Little Integrity . . . I Pledge . . .
. . . to never endorse a product of any kind on Jane's Sweets & Baking Journal that I do not believe in. I've never done so thus far, and I vow never to do so. If I tell you I think something is great, or that I think it is worth spending real money on, then I mean it, rest assured. I promise. And, if I ever talk about a product that I've been given to review or try out, I will disclose that in the post. I'm a mom with two great sons (both now in college), and a really nice husband. I left a long editorial career in reference publishing a few years ago and I've had nary a regret. I recently finished (after four part-time years!) a Baking & Pastry Arts Certificate program in the Culinary Studies Institute at a local community college. It was a lot of fun, a lot of work, and I am so glad I did it. These days, I do a lot of freelance editorial work, something that I really enjoy. "Jane's Sweets" was the name of a very small baking enterprise that I started in late 2007. It bloomed a bit, for a little while, with encouragement from my husband, my aunt, and my first cake decorating teacher, Cindy. Because my Aunt Lydia was my most ardent female supporter in this baking endeavor (she was a lifelong independent business owner herself), this blog is dedicated to her memory. If heaven is real, then I know she's there with my mom, baking up a storm. Like Lydia said one day, just before her 80th birthday, while she and my mom and I were baking in my mom's kitchen, "It's been a fun ride. I'd do it all over again!" Love me, love my mixer . . . If my house were on fire, I'd grab my family, then I'd grab my KitchenAid mixer. Copyright 2009-2018, on original content and photos, Jane's Sweets & Baking Journal. Please contact me at janessweets@gmail.com for permission if you'd like to reuse any of my photos or my content. Please consider informing me if you link to my blog--I'd love to know. -- Thanks for visiting!